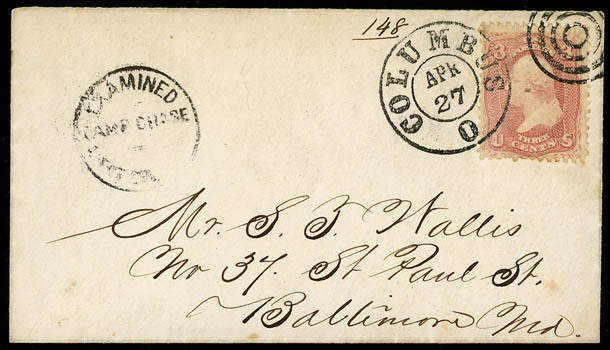 Confederacy, Camp Chase, Columbus O., prisoner's cover bearing U.S. 1861, 3¢ rose tied by sharp strike of "Columbus, O., Apr 27" duplex to Baltimore Md., "Examined, Camp Chase, Lieut Col." circular handstamp (type Ib); small part of flap missing, Very Fine. Scott No. U.S. 65 Estimate $150 - 200. Confederacy, "Camp Chase Ohio Prison No. 1, Augt. 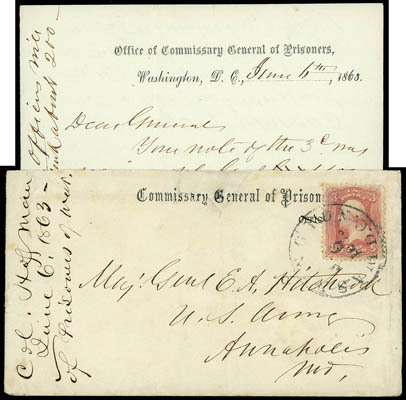 12th 1862", dateline on prisoner's letter from G. Batterwell with original orange cover bearing 3¢ rose (65), tied by prison bar grid cancel, matching bold "Columbus O, Aug 14" cds to Moundsville Va., manuscript "Exd, G.W.B. Allison, Col" examiner's marking, endorsed "Prisoner of War" at left, writer talks of refusing to take loyalty oath to the United States, people being escorted to the Confederate lines, etc., Very Fine. The writer, G. Batterwell, is not found in the National Archives Civil War military records - assumed to be a political prisoner, possibly a copperhead. Moundsville was Union Territory. Civilian Confederate sympathizers in West Virginia were rounded up early in the war and sent to prison camps. 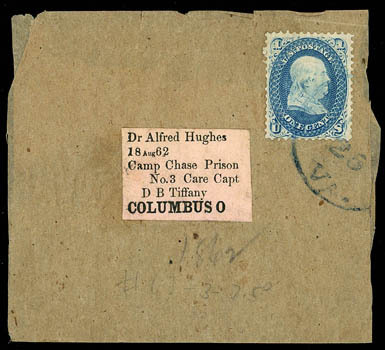 Confederacy, Camp Chase, Columbus O., newspaper wrapper franked with U.S. 1861, 1¢ blue tied by "Wheeling (W) Va." cds, with pink printed "Dr. Alfred Hughes, 19 Aug 62, Camp Chase Prison No. 3, Care Capt. D.B. Tiffany, Columbus, O." 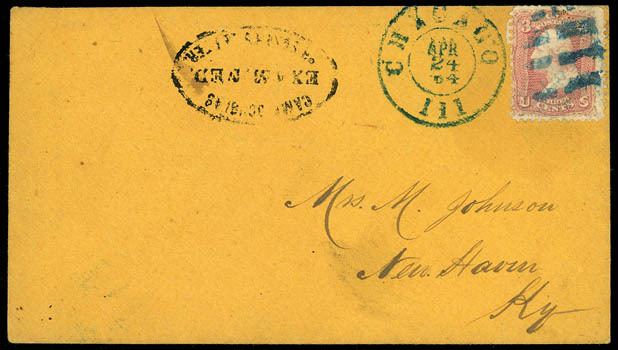 address label, Very Fine and choice, a very rare wrapper usage with only four or five examples known, illustrated in Harrison Prisoners' Mail From the American Civil War (page 182). On May 23, 1861, with his sympathies being with the south, Dr. Hughes had voted for the Ordinance of Secession adopted in the Richmond Virginia Convention. He was incarcerated as a political prisoner and sent to Camp Chase. He was exchanged in 1862 and went to Richmond where he practiced until 1865, when he moved to Baltimore. 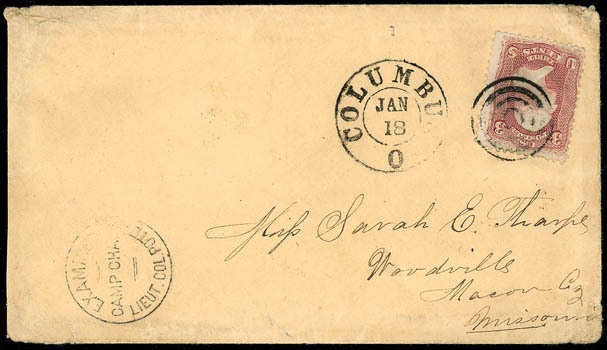 Confederacy, Camp Chase, Columbus, O., United States 1861 3¢ rose (small tear) tied by target cancel with "Columbus, O., Jan. 18" (1864) double circle postmark on cover to Woodville, Missouri, handstamped with "Examined Lieut. Col. Poten/Camp Chase" circular censor's marking (Harrison Type Ia), minor corner wear, F.-V.F., this is the earliest recorded example of this type of Censor's marking. Confederacy, Camp Douglas, Chicago, Ill., orange Prisoner of War cover bearing 3¢ rose (65) tied by blue cork cancel duplexed with "Chicago Ill, Jul 29 '64" cds to William Conrad, Williamstown, Kentucky, black "Camp Douglas, Examined, Prisoner's Letter" oval examiner's handstamp at bottom left, original enclosed letter datelined "Camp Douglas Illinois July 27th 1862" and signed "Henry R. Brier, Co. A. 64 Va. Volunteers" to his grandparents in Kentucky reading in part "…The prison is getting a tiresome place for me. Although we are treated as well as could be expected…", Very Fine. 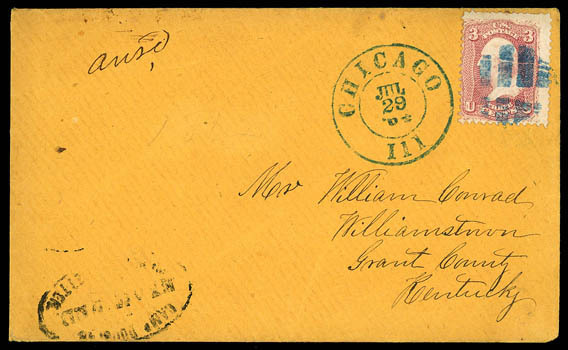 Confederacy, Camp Douglas, Chicago, Ill., cover franked with U.S. 1861, 3¢ rose (65) used with blue cork and matching "Chicago, Ill., Apr 24, '64" cds, to to Mrs. M. Johnson in New Haven, Ky., "Camp Douglas, Prisoners Letter, Examined" oval handstamp (Harrison type I) used from Jan. 13-Apr. 24, 1864 in black, Very Fine, ex-Hedin. Confederacy, Clara Barton, Gen. 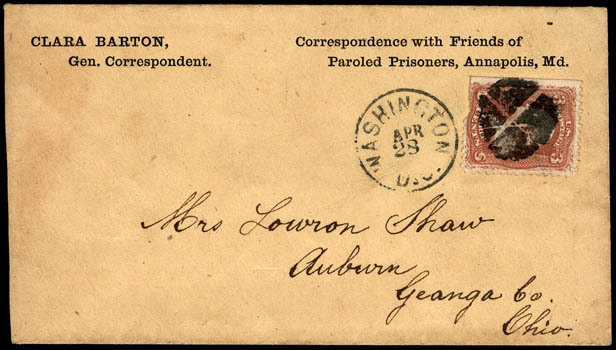 Correspondent - Correspondence Office with Friends of Paroled Prisoners, Annapolis, Md., printed corner card cover to Auburn, O., franked with 1861, 3¢ rose (flaw) canceled by "Washington, D.C., Apr 28" cds and quartered cork duplex, with original enclosure of a printed form letter datelined "April 27, 1865" and signed by Clara Barton in the hand of her assistant Jules Golay (a young Swiss volunteer) with note reading…Your communication of March 28 is received, and the name of Shaw Delos, Co. E 102 Ohio has been placed upon my lists. It will constitute my most earnest endeavor to bring these lists within the notice of returned prisoners everywhere. Be assured that as soon as any information of interest to yourself is gained, it will be most promptly and cheerfully forwarded to you., Extremely Fine; with 2017 P.F. certificate. Scott No. 65 Estimate $1,500 - 2,000. 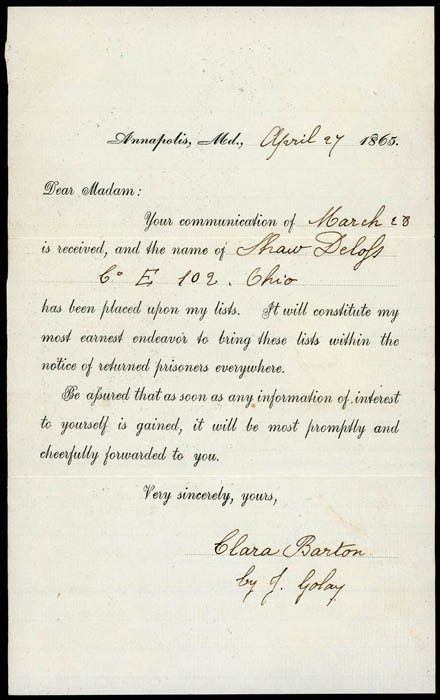 A REMARKABLE MISSING PRISONER OF WAR NOTICE BY CLARA BARTON - LATER TO BE FOUNDER OF THE AMERICAN RED CROSS. After the end of the American Civil War, Clara Barton discovered that thousands of letters from distraught relatives to the War Department were going unanswered because the soldiers they were questioning about were buried in unmarked graves. Many of these soldiers were labeled just as "missing". 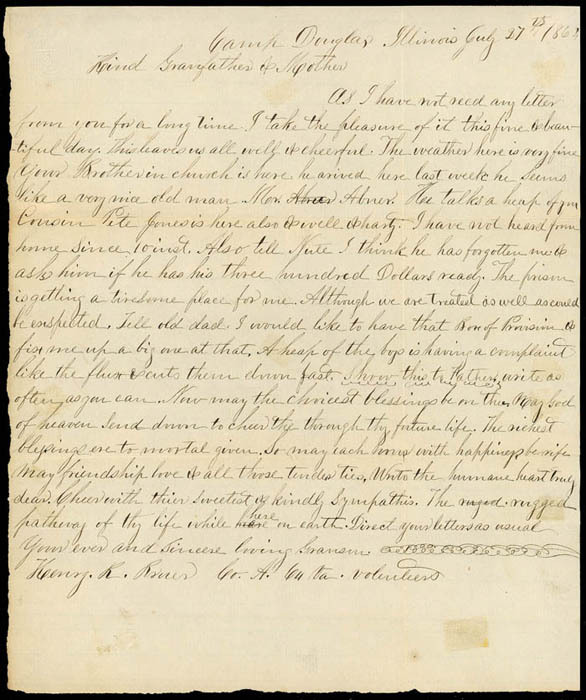 Motivated to do more about the situation, Miss Barton contacted President Lincoln in hopes that she would be allowed to respond officially to these unanswered inquiries. She was given permission, and "The Search for the Missing Men" commenced. After the war, she ran the Office of Missing Soldiers in Washington, D.C. The office's purpose was to find or identify soldiers killed or missing in action. Barton and her assistants (including Jules Foley who is given credit in letter) wrote 41,855 replies to inquiries and helped locate more than twenty-two thousand missing men. Barton spent the summer of 1865 helping find, identify, and properly bury 13,000 individuals who died in Andersonville prison camp, a Confederate prisoner-of-war camp in Georgia. The union soldier in the above notice was one of these prisoners of Andersonville, and was paroled on April 18th shortly before Barton's letter of reply was written. She continued this task over the next four years, burying 20,000 more Union soldiers and marking their graves. Congress eventually appropriated $15,000 toward her project. 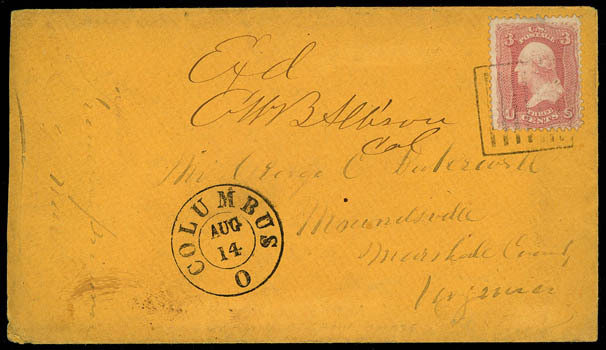 Confederacy, Commissary General of Prisoners, Official Business, imprint with "Official Business" crossed out, on cover addressed to Maj. Genl. E.A. Hitchcock in Annapolis, Md., franked with U.S, 1861 rose tied by "Washington D.C., Jan 6, 1863" cds, original enclosure with matching letter and interesting letter describing the exchange of prisoners and mentions possible executions; repaired cover nick at top with small portion of imprint drawn in, F.-V.F. 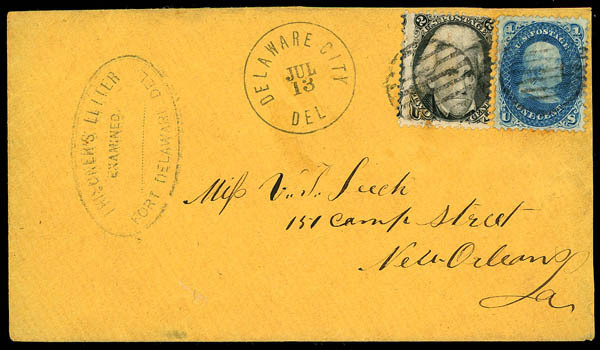 Confederacy, Fort Delaware, Delaware City Del., orange cover bearing U.S. 2¢ black (73), faulty tied by circular grid cancel, used with 1¢ blue (63) replacement, sharp "Delaware City Del, Jul 13" cds to New Orleans La., "Prisoner's Letter Examined. Fort Delaware Del." oval examiner's handstamp; reduced slightly at right, Fine appearance. 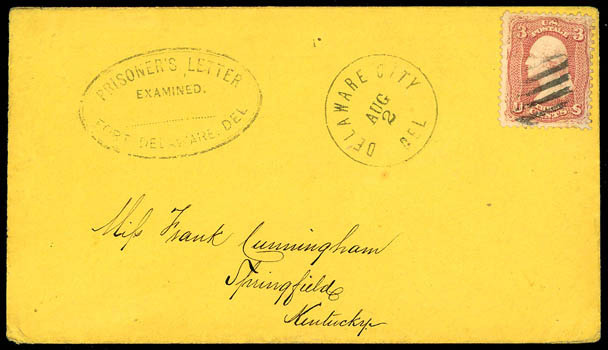 Confederacy, Fort Delaware, Delaware City Del., orange cover bearing U.S. 3¢ rose (65) cancelled by grid cancel, matching "Delaware City, Del., Aug 2" cds to Miss Frank Cunningham at Springfield Ky., clear "Prisoner's Letter Examined. Fort Delaware Del." oval examiner's handstamp, Very Fine.